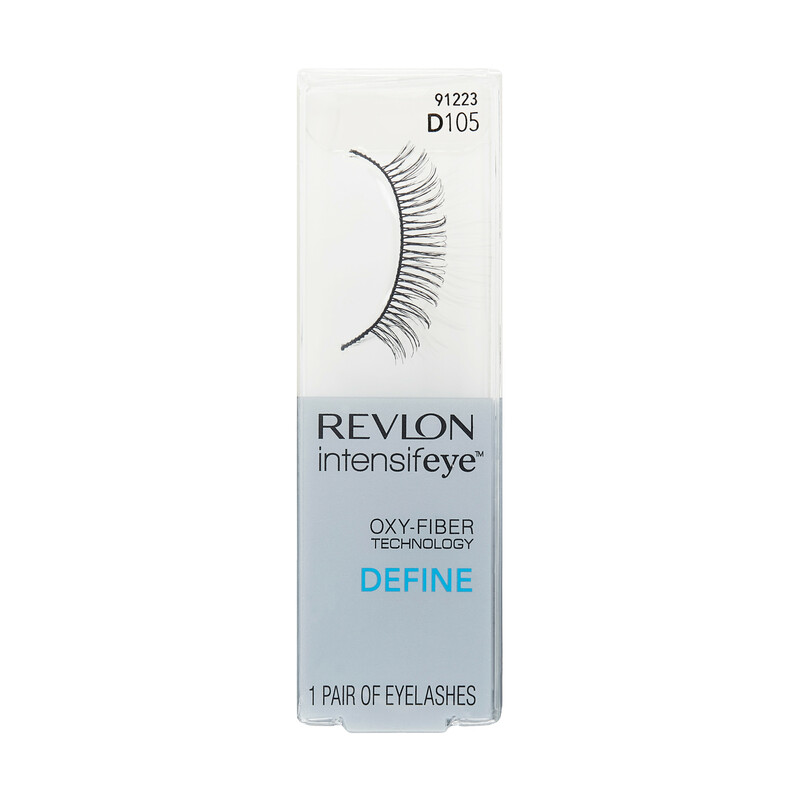 Revlon Intensifeye Define D101 Eyelashes with FeatherLite Technology deliver stunning lashes that are less dense and lighter in weight than existing lash fibers. A unique knitting process (vs. glued or knotted) allows for a precision curl that is longer lasting. Lash fibers are 40% smaller in diameter vs. existing lash fibers for a lightweight lash. An exclusive Oxy-Fiber Technology utilizes an oxygen-infused fabric material (vs. plastic band) for breathability and ultra-comfortable fit. Revlon Intensifeye Define D103 Eyelashes with FeatherLite Technology deliver stunning lashes that are less dense and lighter in weight than existing lash fibers. A unique knitting process (vs. glued or knotted) allows for a precision curl that is longer lasting. Lash fibers are 40% smaller in diameter vs. existing lash fibers for a lightweight lash. An exclusive Oxy-Fiber Technology utilizes an oxygen-infused fabric material (vs. plastic band) for breathability and ultra-comfortable fit. Revlon Intensifeye Define D105 Eyelashes with FeatherLite Technology deliver stunning lashes that are less dense and lighter in weight than existing lash fibers. A unique knitting process (vs. glued or knotted) allows for a precision curl that is longer lasting. Lash fibers are 40% smaller in diameter vs. existing lash fibers for a lightweight lash. An exclusive Oxy-Fiber Technology utilizes an oxygen-infused fabric material (vs. plastic band) for breathability and ultra-comfortable fit. Revlon Intensifeye Lengthen L101 Eyelashes with FeatherLite Technology deliver stunning lashes that are less dense and lighter in weight than existing lash fibers. A unique knitting process (vs. glued or knotted) allows for a precision curl that is longer lasting. Lash fibers are 40% smaller in diameter vs. existing lash fibers for a lightweight lash. An exclusive Oxy-Fiber Technology utilizes an oxygen-infused fabric material (vs. plastic band) for breathability and ultra-comfortable fit. 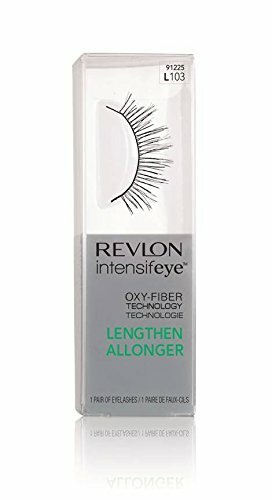 Revlon Intensifeye Lengthen L103 Eyelashes with FeatherLite Technology deliver stunning lashes that are less dense and lighter in weight than existing lash fibers. A unique knitting process (vs. glued or knotted) allows for a precision curl that is longer lasting. Lash fibers are 40% smaller in diameter vs. existing lash fibers for a lightweight lash. An exclusive Oxy-Fiber Technology utilizes an oxygen-infused fabric material (vs. plastic band) for breathability and ultra-comfortable fit. Revlon Intensifeye Volumize V101 Eyelashes with FeatherLite Technology deliver stunning lashes that are less dense and lighter in weight than existing lash fibers. A unique knitting process (vs. glued or knotted) allows for a precision curl that is longer lasting. Lash fibers are 40% smaller in diameter vs. existing lash fibers for a lightweight lash. An exclusive Oxy-Fiber Technology utilizes an oxygen-infused fabric material (vs. plastic band) for breathability and ultra-comfortable fit. Revlon Intensifeye Volumize V103 Eyelashes with FeatherLite Technology deliver stunning lashes that are less dense and lighter in weight than existing lash fibers. A unique knitting process (vs. glued or knotted) allows for a precision curl that is longer lasting. Lash fibers are 40% smaller in diameter vs. existing lash fibers for a lightweight lash. An exclusive Oxy-Fiber Technology utilizes an oxygen-infused fabric material (vs. plastic band) for breathability and ultra-comfortable fit. 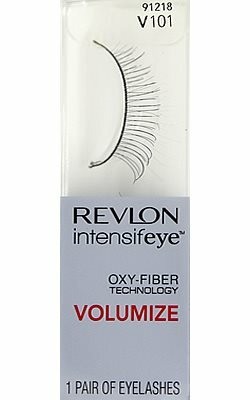 Revlon Intensifeye Volumize V105 Eyelashes with FeatherLite Technology deliver stunning lashes that are less dense and lighter in weight than existing lash fibers. A unique knitting process (vs. glued or knotted) allows for a precision curl that is longer lasting. Lash fibers are 40% smaller in diameter vs. existing lash fibers for a lightweight lash. An exclusive Oxy-Fiber Technology utilizes an oxygen-infused fabric material (vs. plastic band) for breathability and ultra-comfortable fit.